If you have a chance to visit the nation of Morocco, on the far north coast of Africa, then you are in for a treat. If you have a chance to visit the nation of Morocco, on the far north coast of Africa, then you are in for a treat. This country is world renowned for not only its beautiful vistas and cities of blue, but it is also one of the world’s leading exporter of hash. In Morocco, one of the most stunning sights you will ever see, baked or not, is the city of Chefchaouen. Almost all the buildings are shades of blue. There are several theories about the history behind the shade. One is the influx of Jewish immigrants in the 1930’s. In Judaism, blue represents the sky as well as the heavens, reminding people to live with spiritual awareness. It is also rumored to deter mosquitos, who do not land on fresh running water. 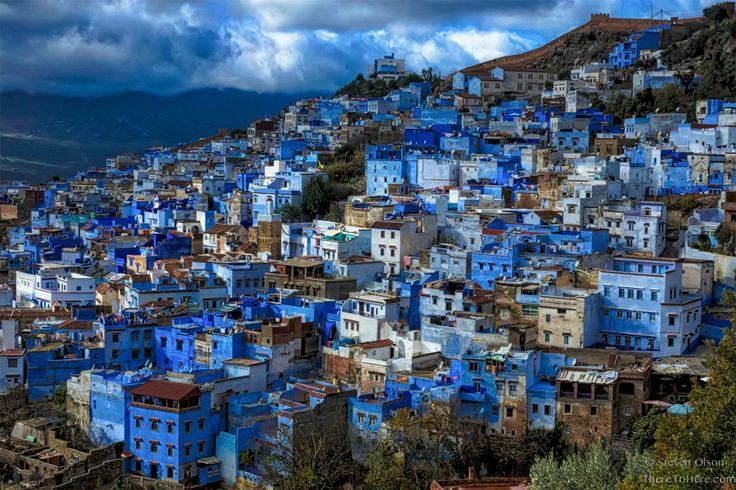 If blue is your favorite color, then this village nestled in the Rif mountains of Morocco might just be heaven. The Rif mountains are the center of hashish cultivation and production in the nation. Although illegal, hash is easy to come by. The industry is so entwined with the culture, and such a boon for the economy, that enforcement is generally lax. The mountainous dry climate is good for growing little else. In fact, although you can find weed here for around $1 – $3 USD a gram, it is far easier and cheaper to buy hash, and buying in bulk is even cheaper. $20 USD will buy you about 8g of herb, or 12g of hash, depending on your haggling skills. That will keep you in good spirits for about a week! If you are a tourist, especially carrying a backpack and American currency, you can live the life of a king. There are hostels for tourists with the privacy to smoke or open markets where men sit and smoke hookah while drinking mint tea and playing cards or dominoes in the shade. Women will want to be a bit more discreet, as there is still a predominant Muslim presence here. In Chefchaouen, young boys calling themselves “guides” will run up to you in the street and rather bluntly ask if you want help finding weed or hash. They will expect a finder’s fee, but with an eye for deception and quality, you can locate one who will help you navigate the inner workings of the culture with ease. There are tricks to getting the best product at the right price. English speaking foreigners are always assumed to have lots of money, but haggling prices is a time-honored tradition. Most dealers will know some English, and initially offer a wildly absurd price. Counter at a quarter of what they announce, and haggle from there. Knowing even a little French or Arabic can drop prices a lot, as can mentioning being given a better offer somewhere else. In general, as long as you don’t wave it around in public, or smoke near mosques, churches, or women, you should be fine. Depending on where you are, that is. While Cefchaouen is a hash haven, along with Marrakesh, other cities are much more serious about the cannabis trade. The penalty for possession or use is 10 years, and Moroccan jails are definitely not the penthouses of other nations. Since cannabis is the largest foreign currency earner of the nation’s industries, often the only ones ever threatened with jail are those who don’t pay their bribes, or tourists. If you do make the mistake of buying off one of the many, many undercover police agents that pose as dealers in the market, money is your best friend. Unless you have made a nuisance of yourself, you can generally just pay a hefty fine on the spot and be on your way. Generally, you want to stick to the north for buying your cannabis products, as areas like Ketama are more likely to have bored or corrupt police and military looking for a thrill. Beware buying in large quantities, letting anyone know where you are staying, or buying “caramelos”, which are prewrapped lozenges of hash for smuggling. Often a dealer will narc on a foreign smuggler to get a break with police. That said, many agree that Morocco is one of the best, and cheapest, places in the world to get high. Have you been to Morocco? What price did you pay for good herb and hash? Share with us on social media or in the comments below.